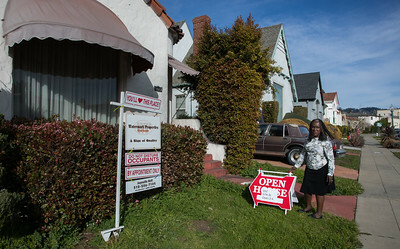 OAK-BUSHROD-0203 Real Estate agent Jaynelle Bell said she has sold two homes this month. Hence she is doing very well in Bushrod Park Neighborhood Jan. 31, 2017. She is standing in front of another home she has listed during an open house. Photo by Paul Kuroda. The Bushrod Park neighborhood in North Oakland, Oakland, California is an area surrounding its namesake park, and bounded by Martin Luther King, Jr. Way to the west, Claremont Avenue to the east, Highway 24 to the south, and the Berkeley border to the north. It borders the neighborhoods of Sante Fe to the west, Fairview Park to the east, and Temescal and Shafter to the south and southeast, respectively. Notable landmarks include the Bushrod Park ballfields and the former Bushrod Washington Elementary School, which share adjoining land on a large greenbelt and open space in the heart of the neighborhood. The park was established in 1903 through the donation of seven and a half acres of land by Dr. Bushrod Washington James, a resident of Philadelphia, Pennsylvania. In the 1910s it was used as a school playground. It has had a long association with local baseball; baseball players Rickey Henderson, Frank Robinson, Billy Martin, and Vada Pinson played at Bushrod in their youth. In the 1960s, the park was used as a practice field by the Oakland Raiders. On April 8, 2006, a block of ice fell from the sky and landed in the park, leaving a crater that was several feet wide. Neighborhood Demographics The Bushrod Park neighborhood is 44.7% African-American, 35.3% White, 9.7% Hispanic, and 7.6% Asian . 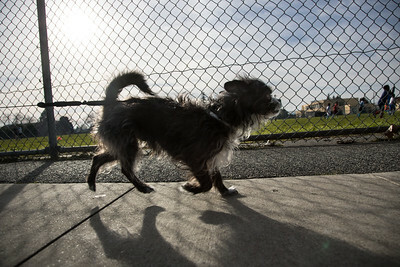 OAK-BUSHROD-0203 A dog named "Wolfgang" walks with his owner (refused ID) along Bushrod Park on Jan. 31, 2017. The Bushrod Park neighborhood in North Oakland, Oakland, California is an area surrounding its namesake park, and bounded by Martin Luther King, Jr. Way to the west, Claremont Avenue to the east, Highway 24 to the south, and the Berkeley border to the north. It borders the neighborhoods of Sante Fe to the west, Fairview Park to the east, and Temescal and Shafter to the south and southeast, respectively. Notable landmarks include the Bushrod Park ballfields and the former Bushrod Washington Elementary School, which share adjoining land on a large greenbelt and open space in the heart of the neighborhood. The park was established in 1903 through the donation of seven and a half acres of land by Dr. Bushrod Washington James, a resident of Philadelphia, Pennsylvania. In the 1910s it was used as a school playground. It has had a long association with local baseball; baseball players Rickey Henderson, Frank Robinson, Billy Martin, and Vada Pinson played at Bushrod in their youth. In the 1960s, the park was used as a practice field by the Oakland Raiders. On April 8, 2006, a block of ice fell from the sky and landed in the park, leaving a crater that was several feet wide. Neighborhood Demographics The Bushrod Park neighborhood is 44.7% African-American, 35.3% White, 9.7% Hispanic, and 7.6% Asian . 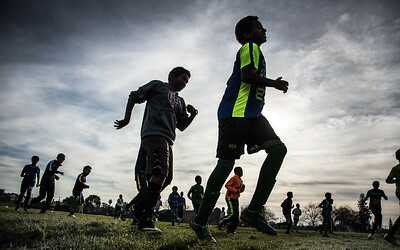 OAK-BUSHROD-0203 Kids practice soccer at Bushrod Park Jan. 31, 2017. They are primary kids who parents came from Eritrea. Photo by Paul Kuroda. The Bushrod Park neighborhood in North Oakland, Oakland, California is an area surrounding its namesake park, and bounded by Martin Luther King, Jr. Way to the west, Claremont Avenue to the east, Highway 24 to the south, and the Berkeley border to the north. It borders the neighborhoods of Sante Fe to the west, Fairview Park to the east, and Temescal and Shafter to the south and southeast, respectively. Notable landmarks include the Bushrod Park ballfields and the former Bushrod Washington Elementary School, which share adjoining land on a large greenbelt and open space in the heart of the neighborhood. The park was established in 1903 through the donation of seven and a half acres of land by Dr. Bushrod Washington James, a resident of Philadelphia, Pennsylvania. In the 1910s it was used as a school playground. It has had a long association with local baseball; baseball players Rickey Henderson, Frank Robinson, Billy Martin, and Vada Pinson played at Bushrod in their youth. In the 1960s, the park was used as a practice field by the Oakland Raiders. On April 8, 2006, a block of ice fell from the sky and landed in the park, leaving a crater that was several feet wide. Neighborhood Demographics The Bushrod Park neighborhood is 44.7% African-American, 35.3% White, 9.7% Hispanic, and 7.6% Asian . OAK-BUSHROD-0203 in Bushrod Park Neighborhood Jan. 31, 2017. 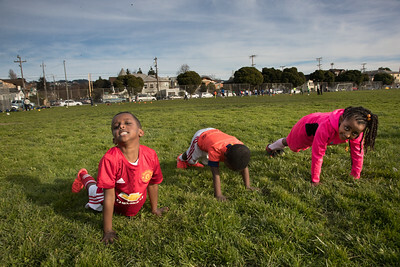 OAK-BUSHROD-0203 Henok Efren, 6, his 3-year old brother Ksbs (sic...as written by Henok) and Elian Aalem, 7 during soccer practice in Bushrod Park Neighborhood Jan. 31, 2017. Parents were not around to get name of little brother and I was told by another adult that I can't take photos in this public domain. So that's what the brother wrote "Ksbs." Photo by Paul Kuroda. The Bushrod Park neighborhood in North Oakland, Oakland, California is an area surrounding its namesake park, and bounded by Martin Luther King, Jr. Way to the west, Claremont Avenue to the east, Highway 24 to the south, and the Berkeley border to the north. It borders the neighborhoods of Sante Fe to the west, Fairview Park to the east, and Temescal and Shafter to the south and southeast, respectively. Notable landmarks include the Bushrod Park ballfields and the former Bushrod Washington Elementary School, which share adjoining land on a large greenbelt and open space in the heart of the neighborhood. The park was established in 1903 through the donation of seven and a half acres of land by Dr. Bushrod Washington James, a resident of Philadelphia, Pennsylvania. In the 1910s it was used as a school playground. It has had a long association with local baseball; baseball players Rickey Henderson, Frank Robinson, Billy Martin, and Vada Pinson played at Bushrod in their youth. In the 1960s, the park was used as a practice field by the Oakland Raiders. On April 8, 2006, a block of ice fell from the sky and landed in the park, leaving a crater that was several feet wide. Neighborhood Demographics The Bushrod Park neighborhood is 44.7% African-American, 35.3% White, 9.7% Hispanic, and 7.6% Asian .